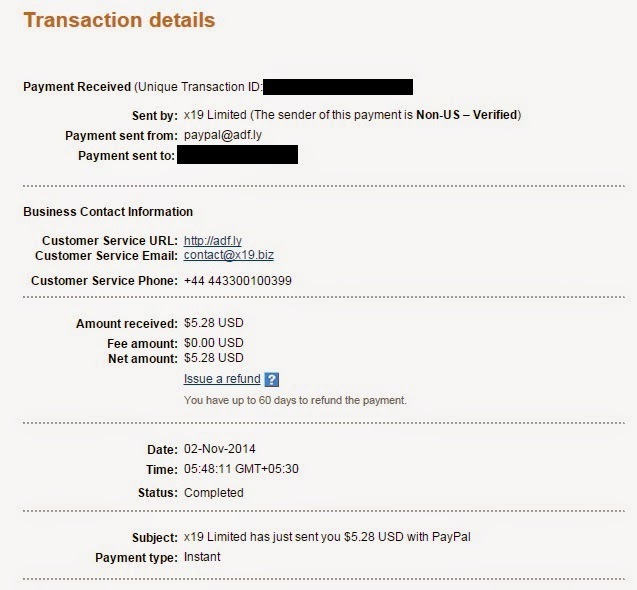 Earn money by shortening and sharing links: adf.ly review 2014 with payment proof. You may have seen a lot of short links for long urls and so are many URL shortening websites. But adf.ly is a URL shortening website with a twist. You get paid whenever these links are visited. Get Paid? Yes you really get paid. I was also amazed when I found that I have made actually come cents just by sharing links. Now let’s discuss in detail how adf.ly works. You shorten a link and share it and you get paid. Amazing! But what is the mechanism behind? on your websites, actually it do not needs a website. They also don’t show Ads in annoying pop-ups. Whenever someone clicks to your link, which you have shorten using adf.ly, before redirecting the person to the main URL, they show an advertisement which the person can skip after 5 seconds. A person has launched a new range of products, and now he wants to promote them so that people can know about it. Adf.ly do the same job for him. The person will pay. For example $5 for per 1000 times his Advertisement is shown. Now adf.ly will keep its share, lets say $1 and put this advertisement in the links its users (You) shorten. Now everyone who click the link, will see the Advertiser Ad and after 5 seconds he can skip the Ad and move on the main destination. ABSOLUTLY NOT! Being an adf.ly user for over 2 years, I can say with confidence that adf.ly is absolutely legit and better then the most of the banner Ad-networks. Adf.ly was started in year 2009, and it has been successfully operating since last 5 years. No scam will ever last that long. Moreover, adf.ly is reported to be in top 100 websites on alexa. A scam can never reach that high. Adf.ly is a real company established by a real person. You can find all information on their website; they even have customer support number. They have been paying their user on time since last 5 years and there have been no delays or problems with payments over the time. There are lots of payment proofs available (you can find one at the end of this article) even they have a whole forum of their own. Till now, adf.ly has more then 2 million active users and still growing. 1. The biggest Pro of adf.ly is that you DO NOT need any website or blog in order to use adf.ly. You can share links anywhere on the internet like in emails, social networking sites, forums (Not all forums allow adf.ly links so first check before posting) etc. And you can share any link you want. There is no restrictions on what kind of link you want to shrink. You can shrink and share any link you want. For example if you found this article interesting then you can shrink and share it too. 2. Very simple and easy to use interface. 3. Easy sign up, just Email id and password and you are good to go. 5. Minimum payout is just $5 and they pay using paypal and payza. 6. Detailed stats of all the money you have earned so far. 1. If you are using adf.ly on your website then it might annoy your visitors. 2. Java script is required for this to work properly. Minimum payout and payment methods and schedule. As you have already red that the minimum payout is just $5. Their pay their users on a monthly basis, provided you have reached the minimum payout. 1. Full page Ads- These are full page Ads shown before redirecting to the main destination. These are interstitial CPV (Cost per view) Ads. 2. Top banner Ads- The person who clicks the link, will be immediately redirected to the main destination. Just a small banner of Ad on top will appear, which can be closed any time. These are CPM(Cost per Mile) Ads. 1. Mass shrinker- Allows you to shrink up to 20 links together. 2. Multiple Links- Converts all the links present on your website (or a page of a website) to adf.ly links. You simply have to paste the HTML code of your blog (or a page of your blog) into the windows on the tool page and it will generate a new code for you. Just replace the old HTML code with the new generated code. The above links are my easy links. Just to show how it works, You have to use your own easy link. These Easy links are great because you do not have to visit adf.ly every time you want to convert a link into paid link and money gets credited to your account. 4. Full page script- This tool will provide the code, if you want to convert all the links on your blog/website to adf.ly links. 5. Website Entry Script- If you want me make money from every visitor who visits your website from any source, then you need this script. An Ad will be shown to visitors whenever they visit your website. 6. Pop-ads- This will show and pop-up advertisement whenever someone visits your blog. There are several other tools like- Bookmarklet, API documentation, Export Links and stats, Domain, Mass delete etc. You can get information on them after you sign up for adf.ly. Adf.ly payout rates are around $2 for every thousand full page ads and around $1 for every thousand top banner Ads. These are just average rates, it differ from country to country. Like in USA and for US visitors it is around $4 per thousand full page ads. Adf.ly is unique and easy way to monetize your content, oh want I am sorry, monetize your LINKS. It is not going to make you millionaire over night, but you will get paid really something. (way much better then “Quick money scams, which eat you time and money both). With little efforts and patience you can really do well with adf.ly. Some people are making about $50 a day and some even more. But make sure you have something valuable behind the door, and then only it will be worth for someone to wait and see the AD. If you are planning to spam random links on the internet like a robot, it will lead you no where. And spammers get an easy BAN. So be sure about that. Sign Up for adf.ly from here and experience yourself! If you have any questions, leave them in comment section below. Please leave your feed back in comment section below. Share this article, like us on Facebook and hit the g+1 button. Hello there, I am a student studying in class 12. Computers, technology, internet are my areas of interest. I have learned a lot about coding, designing, internet since I was in class 8 and still learning. Now I want to share my knowledge with everyone so they can also get benefit from that. All types of advertisements for your blog! Followers widget, gadget, box for blogger.